Like many other Central Anatolian cities, Erzincan is one of those places with very little there there. 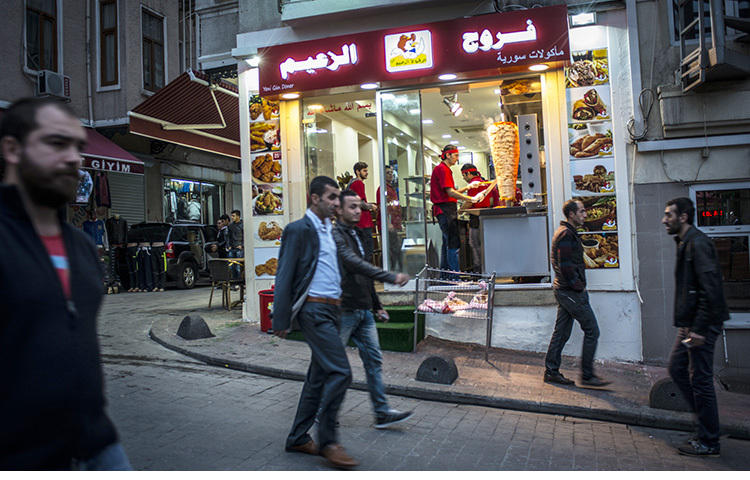 The natural setting – on a high plateau and ringed by craggy peaks – is promising, but the town itself feels like it’s been scrubbed clean of all traces of history or local distinctiveness, its streets lined with characterless buildings painted in fading pastels, their ground floors occupied by the same furniture and supermarket chains found in every other city in the Turkish heartland. 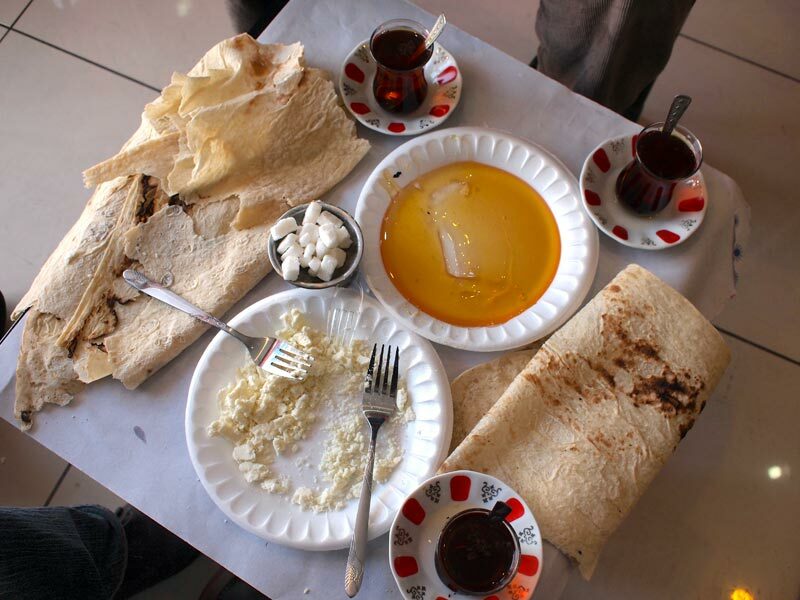 Erzincan does have one thing going for it, though: it’s the kind of place where you can land at the airport, hop into a waiting taxi and ask your driver to take you to the local cheese sellers’ bazaar, and he’ll take you straight there, no questions asked, as if it’s the most natural request he could get. As it should be. 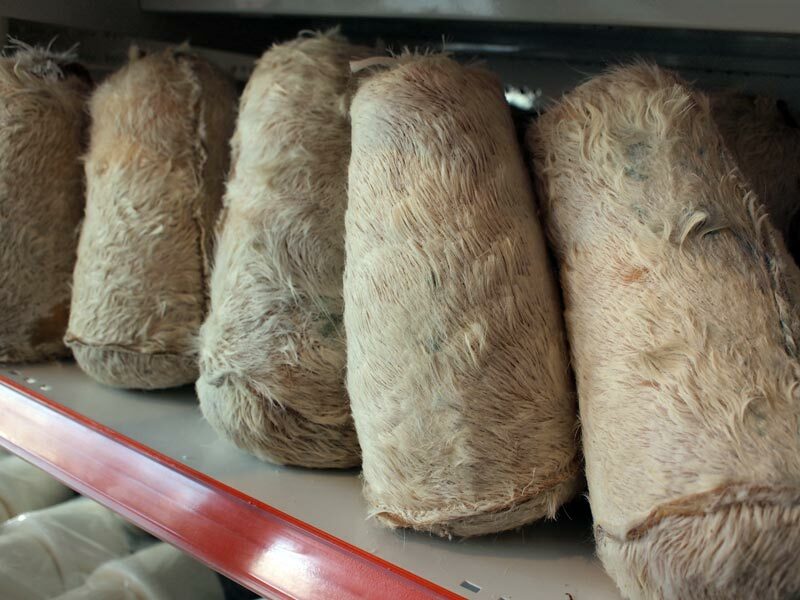 Erzincan is famous throughout Turkey for its tulum, a sharp and crumbly raw sheep’s milk cheese traditionally aged inside a goatskin, and the compact market is perhaps the closest thing the city has to a historical attraction. 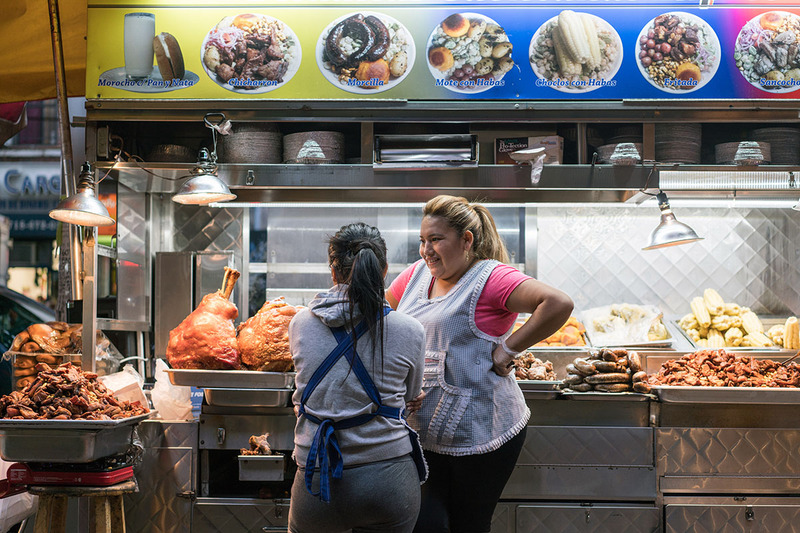 The current peynirciler çarşısı, about a dozen small shops housed in a U-shaped strip mall, may not be that old, but the vendors there are part of a homegrown tradition that goes back centuries. Walking through the market on a sunny November morning, we soon found ourselves sitting down inside one of the shops for an impromptu breakfast starring the local specialty. The shop, its spotless glass-lined refrigerators loaded with tulum-filled plastic containers (goatskins, though still in use, are less common these days), belonged to Yalçın Kaya, a kindly third-generation cheesemonger who, it turned out, moonlights as an imam at a nearby mosque. It was a fine start to the day, but the truth of the matter was that we didn’t come here for tulum. We didn’t even come here to see Erzincan. 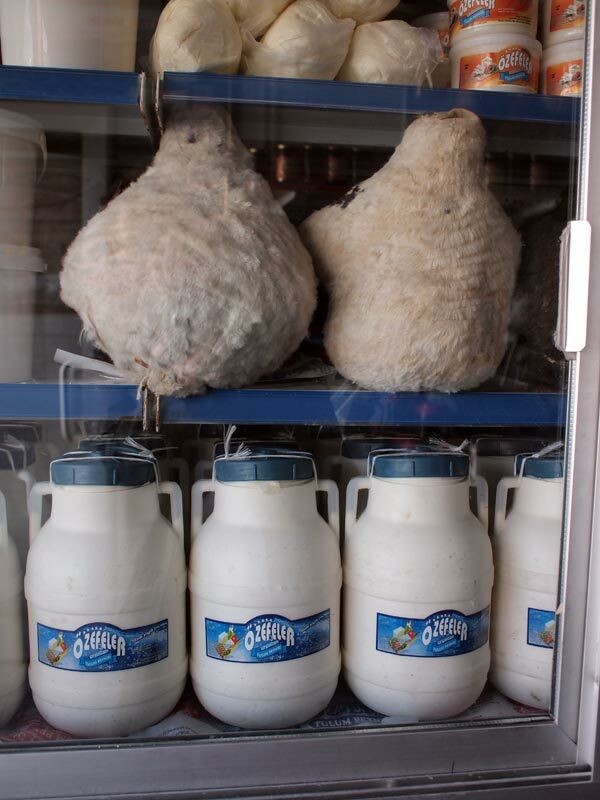 The reason we came to this part of eastern Turkey was to uncover the roots of America’s best selling “Greek” yogurt, and that meant heading out of town and towards İliç, an overgrown village (pop. 6,000) that has suddenly found itself on the dairy world’s map because it’s the birthplace of Hamdi Ulukaya, founder of the wildly successful Chobani yogurt brand. 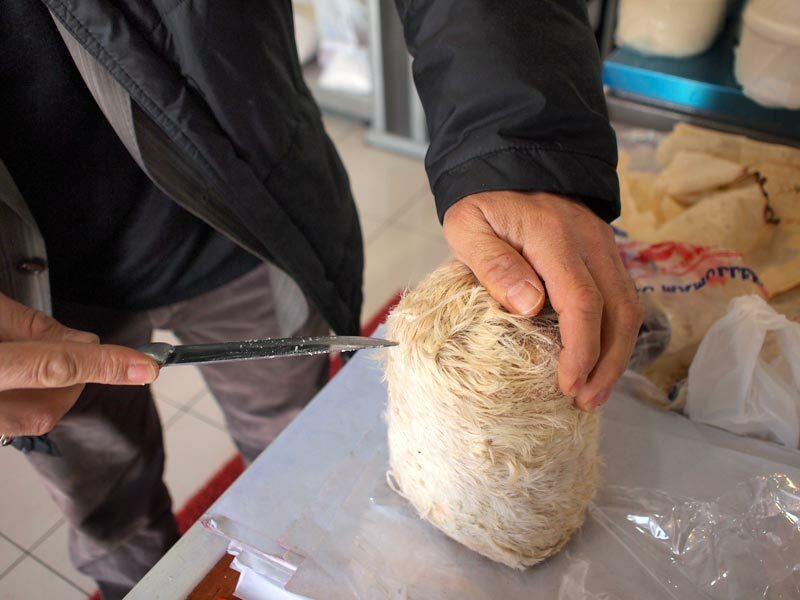 Ulukaya and his wonderful cheesecloth-to-riches story had recently been profiled in the New Yorker, in a story that ended up in Greece as the author tracked down that country’s best yogurt (and which we found in Athens). The article left us thinking, though, about Ulukaya’s humble origins in the high pastures of eastern Turkey. What was it about the culture of traditional small-scale dairy production there that might have shaped his success, we wondered? And, more importantly, just what does the yogurt that he grew up on taste like? To get to İliç, a two-hour drive from Erzincan, we traveled along a serpentine road that closely tracked the course of the nearby Euphrates River, cruising through a landscape of high mountains, brown and bare this time of year, and past unremarkable small villages with evocative names like “Smokey” and “Rose Garden,” made up of squat concrete homes with rusting corrugated metal roofs held down by cinder blocks. 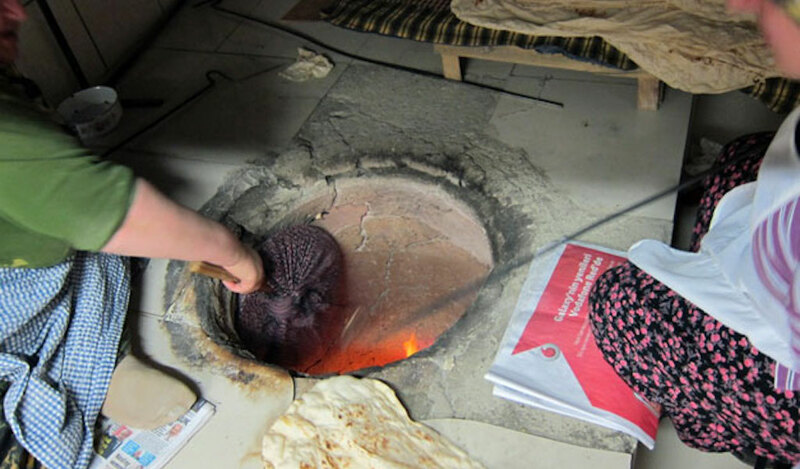 İliç, clinging to a mountainside high above the Euphrates, is something of a provincial capital, with a collection of recently built low-rise apartment buildings and a new community college, which offers courses on animal husbandry – sheep outnumber humans in the area by a factor of about ten to one – and dairy production. Finding relatives of Ulukaya’s in İliç was easy. Harder to find in the village was what has made him famous: yogurt. We had come half expecting İliç to be awash in the stuff, a kind of dairy wonderland full of busy artisans churning out container after container of yogurt. 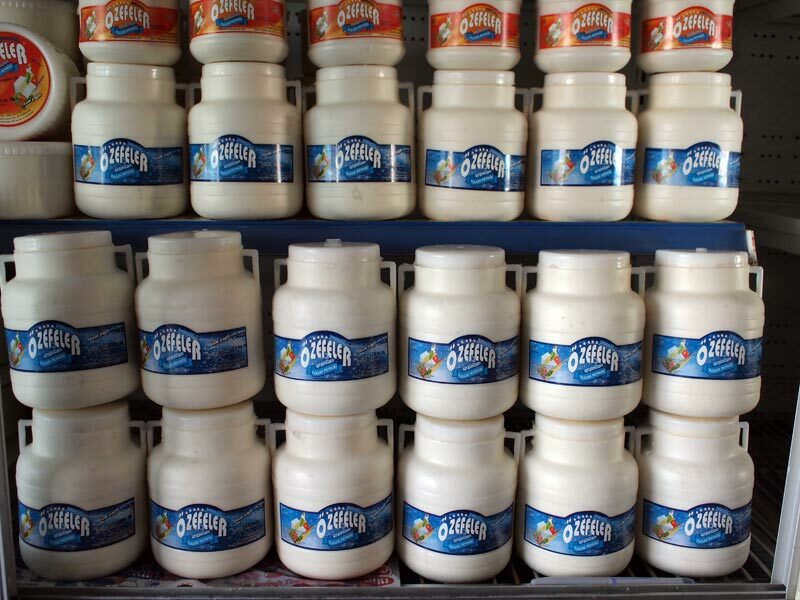 But as Ömer Ertan, a rector at the local college, explained to us, in these parts, yogurt – a year-round staple of supermarket shelves around the world – is actually a seasonal product. During the fall and winter months the sheep are pregnant and not producing milk. No milk, no yogurt. Moreover, yogurt here is very much a home product, each family making its own during spring and summer’s bounty of sheep’s milk, leaving little demand for the store-bought kind. “There’s no real market for yogurt,” one local shepherd told us. Ertan, who offered to show us around while we were in İliç, had a plan, though. Along with Mehmet Demirtaş, a local veterinarian, and Murat Çelebioğlu, who runs the Ministry of Agriculture’s office in town, we hopped into a pickup truck and went speeding downhill towards the Euphrates and the nearby village of Çilesiz. There we were welcomed into the tidy home of Veli Gürbüz, the village’s 60-year-old muhtar (headman) and the proud owner of a flock of some 400 sheep. As we sat on floor cushions in Gürbüz’s living room, painted a shade of light, creamy purple that, perhaps owing to what first brought us to the area, made us think of blueberry yogurt, the çoban (cho-bahn, Turkish for “shepherd”) described to us the local way of life, one that has long revolved around the seasons and the life cycles of both animals and plants. Come late spring or early summer, when the snow has mostly receded from the mountains, entire families and their flocks of sheep decamp for the yayla – high pastures filled with grasses and wild flowers for the animals to graze on – where they live in tents for some four or five months, their days revolving around a routine of milking the herd and then starting the process of turning the milk into cheese (almost exclusively tulum) by adding rennet to it, which helps separate the solid curds from the liquid whey. 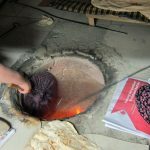 By around the age of seven, a local child can perform most milking and cheesemaking tasks, Gürbüz, who has mischievous eyes and a weathered, sun-kissed face, told us. “From the time a child is born and opens his eyes, there’s cheese,” he said, with a deep laugh. The high mountains and the yayla were visible through the window of Gürbüz’s living room. Although it’s a full day’s walk to get to the pastures with the herd, Gürbüz frequently gestured towards the yayla while talking to us, as if they were his backyard and he was just down in the house for the winter, keeping an eye on them through his window. 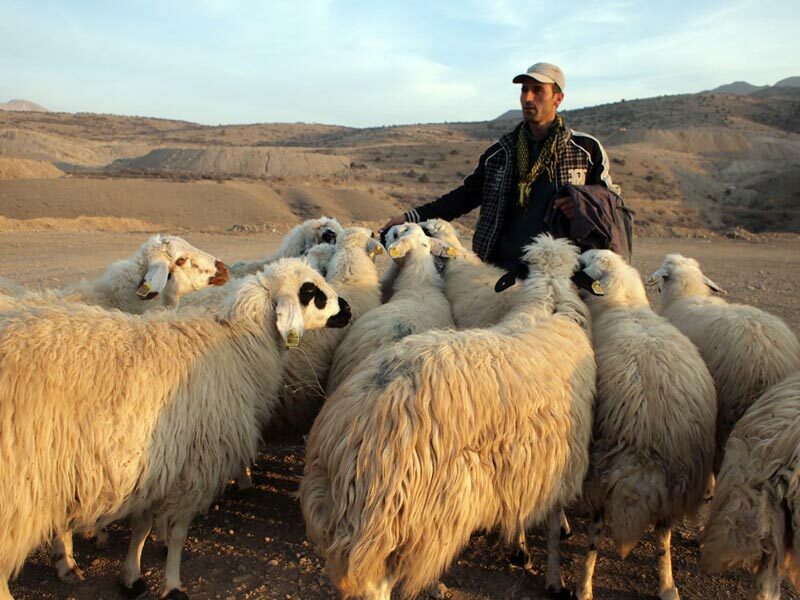 As the muhtar was talking, his nephew Mustafa, a herder with a flock of some 700 sheep, walked in carrying a large round metal tray which he laid down on top of a gingham cloth that had been spread out over the carpet. Beautifully arranged on the tray were the enticing results of all those months spent up in the yayla: plates of ivory-colored chunks from a tulum that had been aged inside a goatskin for two months and of delicate shavings of lighter-colored butter, as well as bowls of almost snow-white yogurt – all made from ewe’s milk. 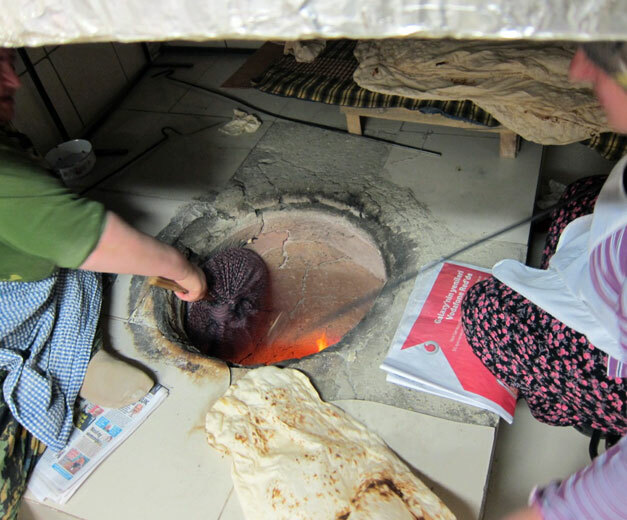 Also on the tray were folded-up ovals of freshly made sac ekmeği, paper-thin flatbreads that were baked on a convex griddle. Following Mustafa’s lead, we tore off strips of flatbread, loaded them with some butter and tulum and then rolled the whole thing up and took a bite, the mellow butter acting as a soothing counterpoint to the sharp and slightly nutty cheese. 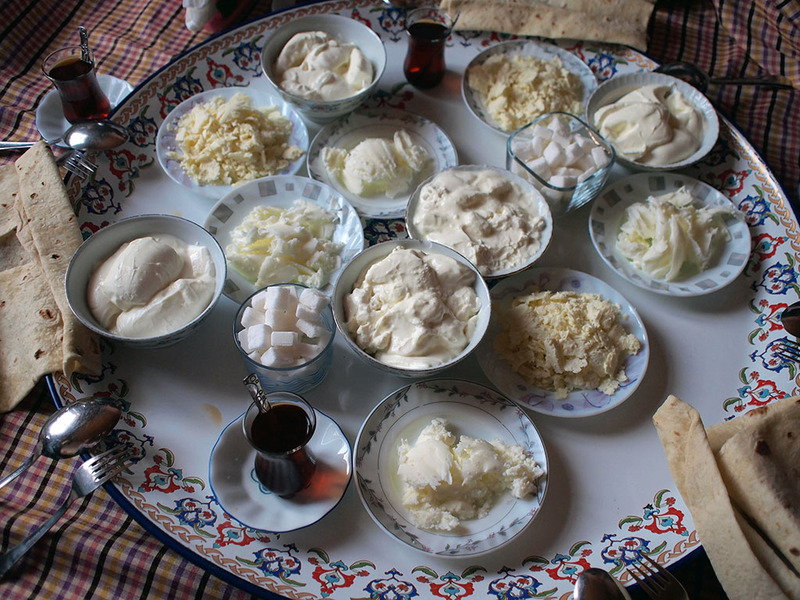 As we reached for a bowl of yogurt, we heard one of our companions speculatively whisper to another, “This is what Hamdi’s yogurt is like.” This was not Chobani, however, which is made from machine-strained cow’s milk, but rather the deeply satisfying rustic yogurt of a çoban – naturally thick, high in fat and extremely, almost mouth-puckeringly, tangy. A yogurt like this would not likely find a home in the average supermarket’s dairy aisle. Shepherding and small-scale dairy production are never easy work, but Veli and Mustafa Gürbüz told us that these days are especially challenging. They are having a hard time finding shepherds who are willing to take the sheep up into the high pastures, an arduous task that often includes working at night, when the animals like to graze. 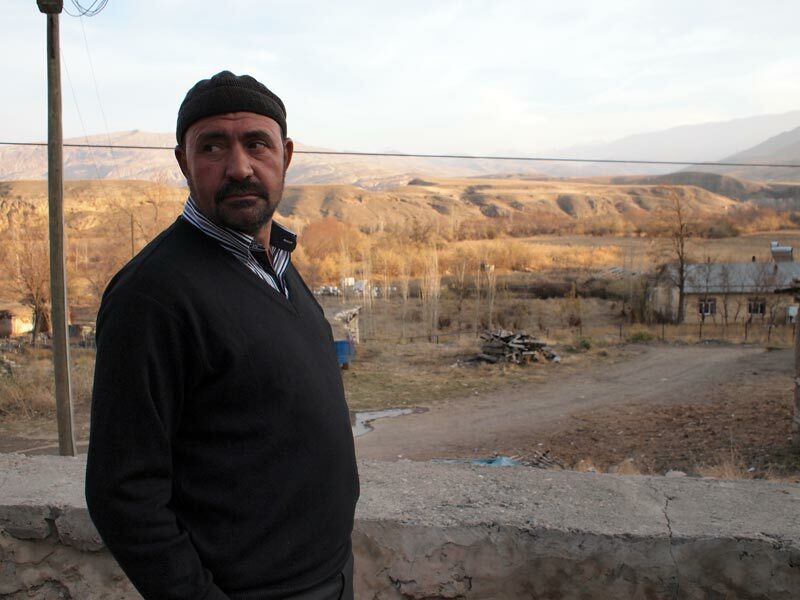 In recent years, several new gold and iron ore mines have opened up in the Erzincan region, and more and more shepherds are putting down their staffs in favor of pickaxes. 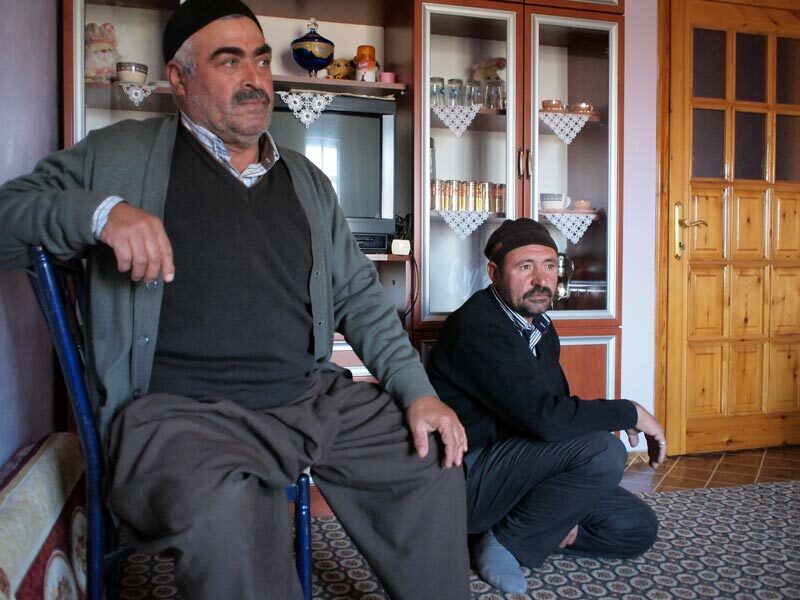 “Since the mines opened, there are no çoban,” the elder Gürbüz said. 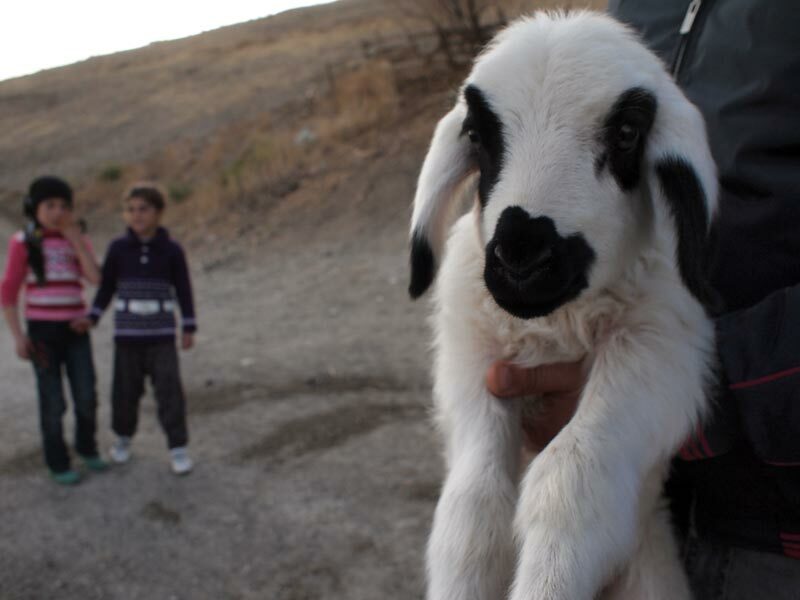 “They all want to be able to sleep at night, so they go to work in the mines.” Unable to find local help, herd owners like Gürbüz must now look far and wide for itinerant shepherds to hire, with many these days coming from around the city of Urfa, some 462 kilometers (287 miles) away. 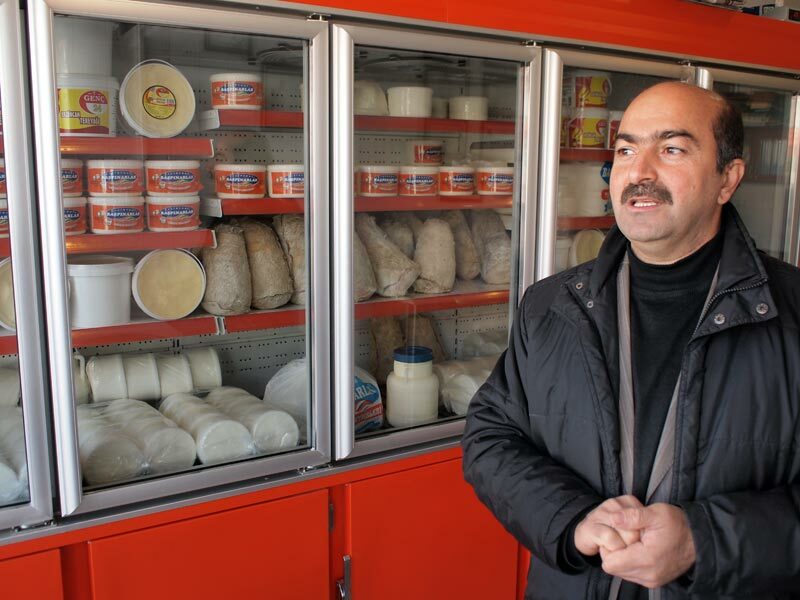 Meanwhile, Ertan, the community college rector, told us that this year no students signed up for the dairy production and livestock courses at his institution. They prefer to take classes in mine engineering, he said. The bigger threat to the local way of life and, more worryingly, to the traditional way of producing tulum – still the major source of income for many of the sheepherding families in the region – is coming from the government. 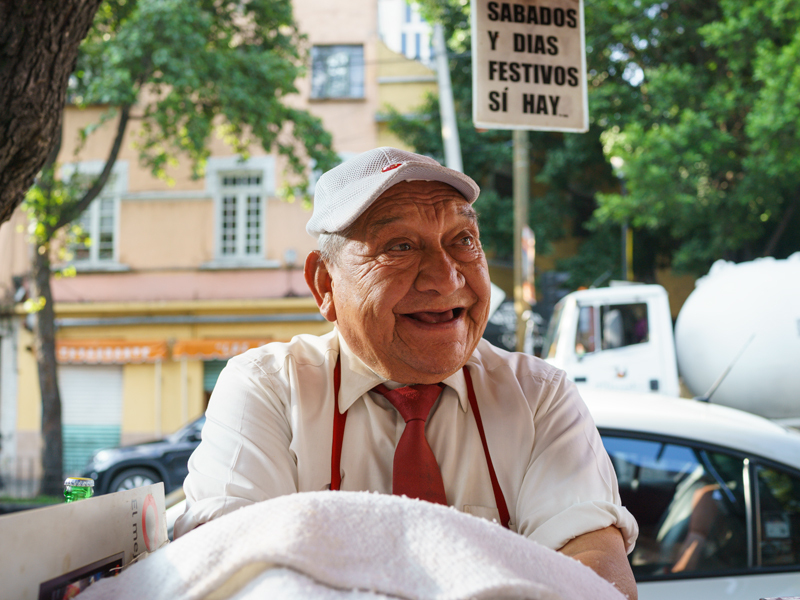 New regulations, yet to be put into effect, would require the cheese to be made with pasteurized milk, a change that could ultimately sink the current small-scale system of tulum production. The way things are done now, with the cheesemaking process beginning up in the yayla, the shepherds can bring down from the mountain a product that, though still unfinished, has shed much of its excess moisture and perhaps 60 percent of its original weight, making it easier to transport to town for aging and packing. Considering that transport is still done using mules – there are no paved roads leading up to the yaylas – that’s no small matter. Pasteurizing the milk up in the high pastures does not seem possible, while the infrastructure for taking heavy raw milk down from the yaylas does not currently exist. The question of pasteurization is more than a matter of logistics, though. For the shepherds we spoke with, the bigger concern about the new regulations is about how it would change the cheese itself. 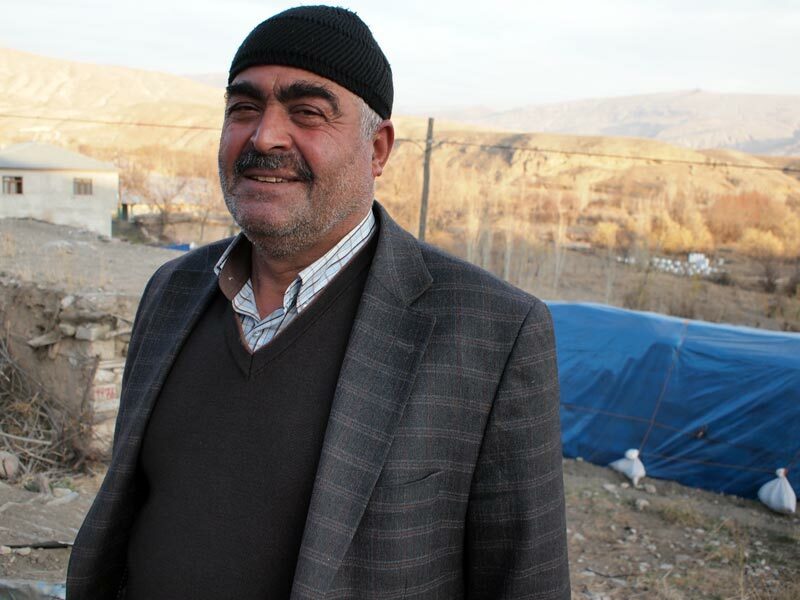 In Yeşilyurt, a village of 400 people and 8,000 sheep on the outskirts of İliç, we spoke with Muhlis Şirin, a herder who was standing by a large pen where several sheep were happily munching on dry bushes and some spindly green shoots. 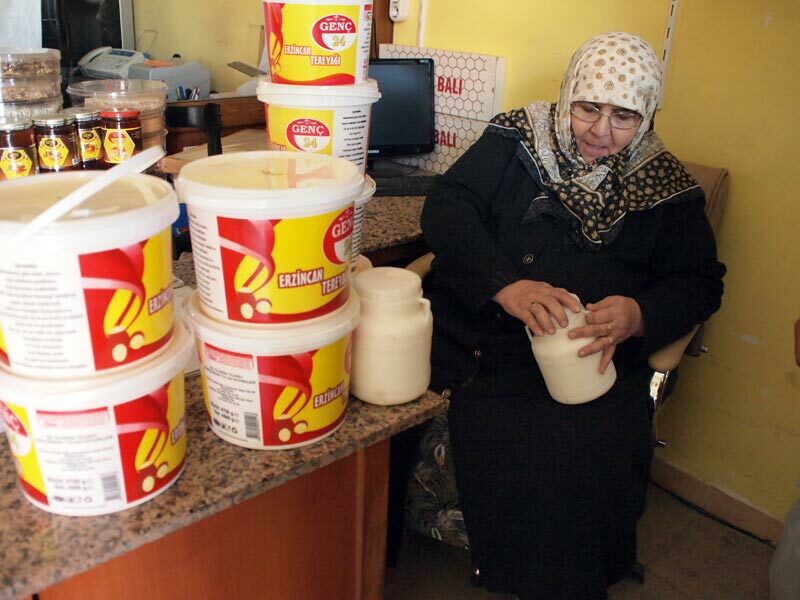 Şirin had at one point spent time away from the village, working for eight years in a large cheese factory near Urfa where pasteurized milk was used. He was never able to get used to the taste of that milk, he said. 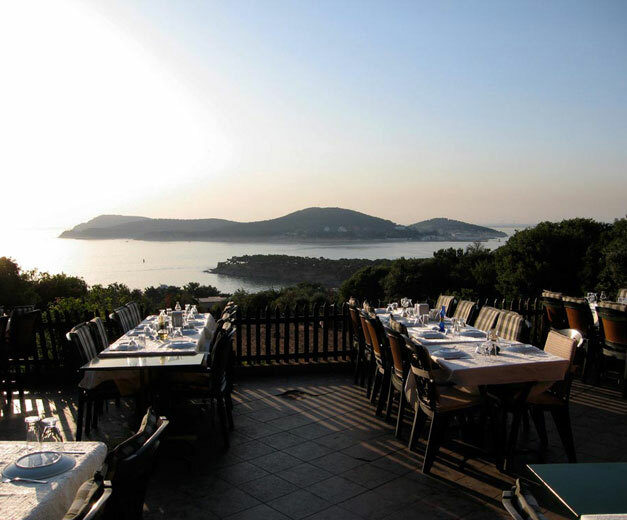 Yeşilyurt is set on a high bluff that overlooks the Euphrates. As we looked down from Şirin’s yard towards the river, we noticed a new high bridge that was being built not far from the current one that leads from the road to Erzincan and into İliç. When we inquired about it, we were told a dam was being built downstream and that, when completed, it will flood parts of the valley below, including the current bridge. 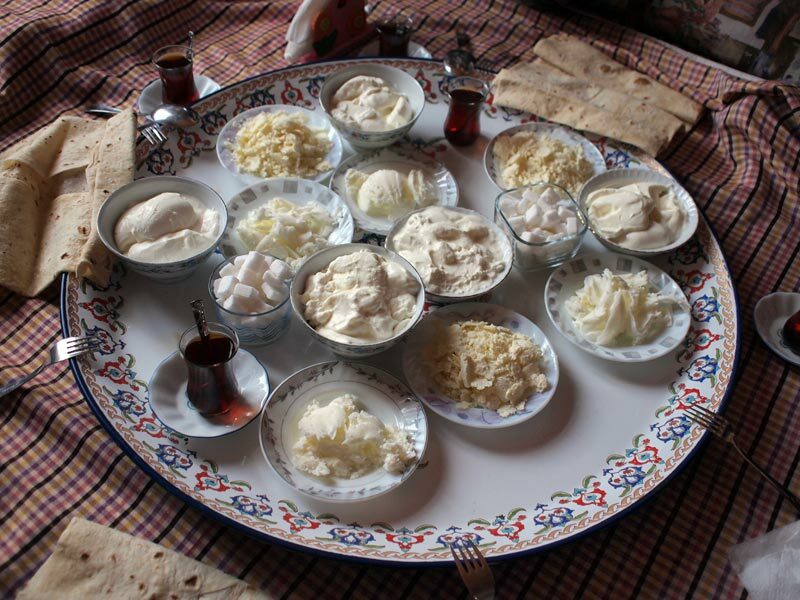 And what about Çilesiz, the village where we had just had our yogurt with Veli Gürbüz? It will be completely flooded, we were told. 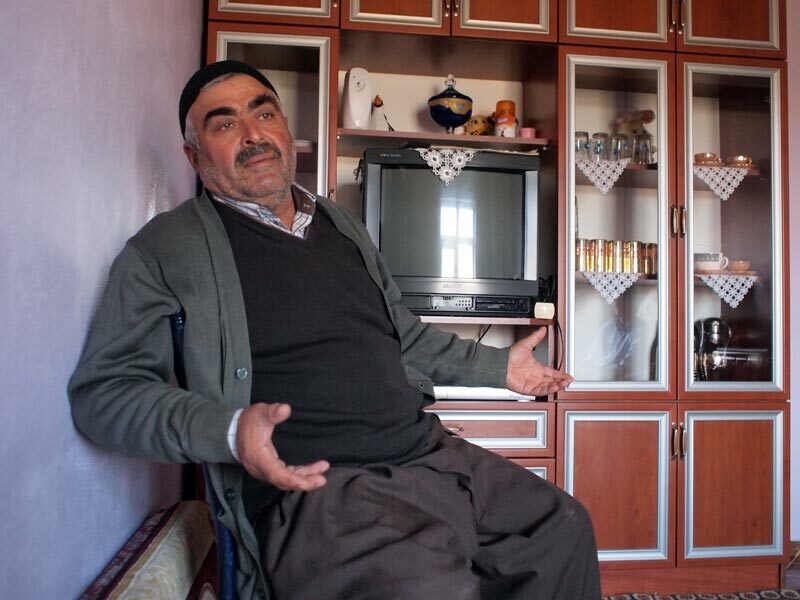 It took us a minute to register the fact that during our time at Gürbüz’s home, the subject of the dam didn’t come up. The shepherd was so caught up in the day-to-day struggle of maintaining his way of life, he forgot to mention to us the biggest problem he is currently facing: in a few years, the village he lives in will be completely underwater. Before leaving İliç, we stopped by the cheese shop of Mustafa Sağu, Hamdi Ulukaya’s cousin, to buy a small goatskin-encased piece of tulum. Sağu had his errand boy wrap the tulum in silver giftwrap and several plastic bags, but the package still gave off a distinct, sharp aroma. Getting into a taxi that would take us out of town, we put the cheese in the trunk, where the driver had some delicious smelling still-warm cakes that he was delivering somewhere near our final destination. We apologized to him for the less appealing goatskin odor, but he smiled and waved off our apology. Like many others in the area, the driver, Hüseyin, had grown up working as a shepherd and eventually was able to purchase a flock of his own. 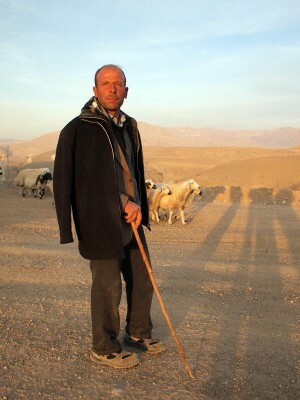 He was forced to sell his sheep in the 1990s, though, when fighting in the area between the Turkish military and guerillas from the separatist Kurdistan Workers’ Party (PKK) made it difficult for shepherds to take the animals out to graze without getting in the line of fire. As we drove along the banks of the Euphrates, Hüseyin asked us where we were from. “The United States? I have a relative there. Hamdi Ulukaya. Do you know about him? He went off to college and did well for himself,” he told us in a tone that indicated neither jealousy nor pride, but rather the simple acceptance of life as it is. “The rest of us? 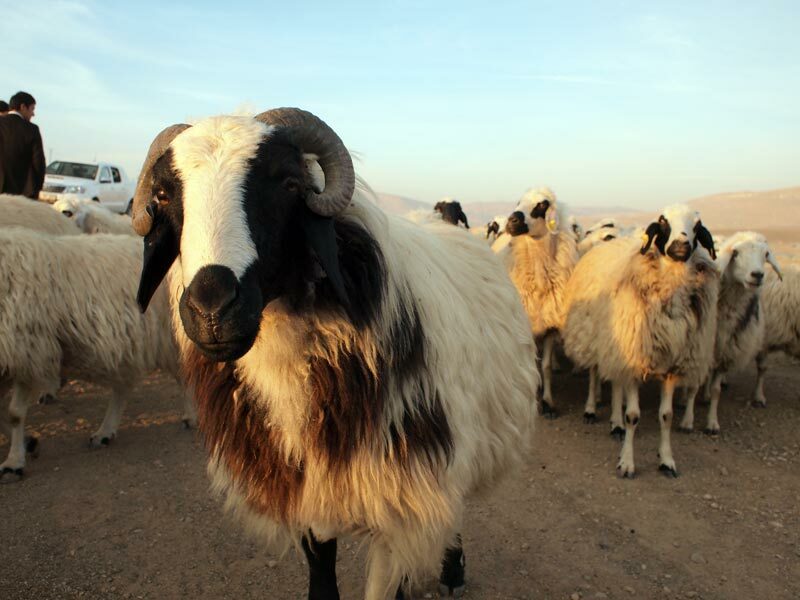 We became shepherds,” Hüseyin continued, shifting into a lower gear as he guided his taxi into yet another uphill curve.